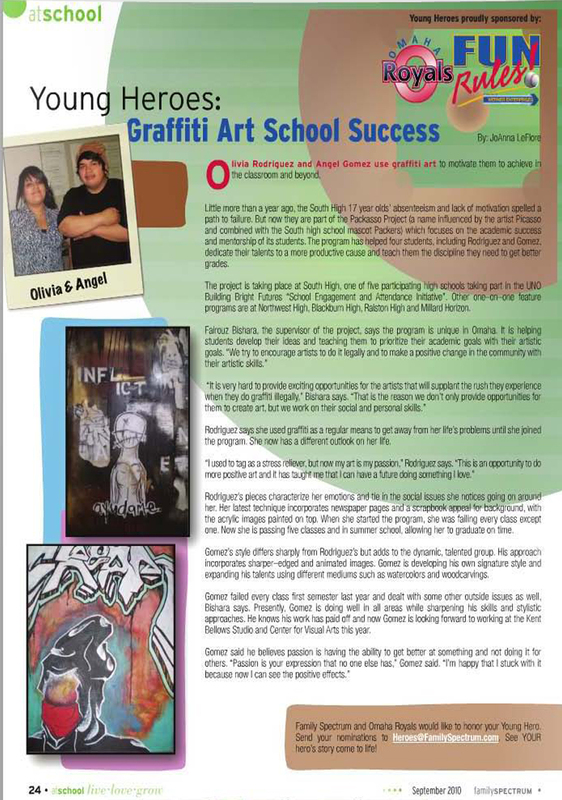 Olivia Rodriguez and Angel Gomez use graffiti art to motivate them to achieve in the classroom and beyond. Little more than a year ago, the South High 17 year olds’ absenteeism and lack of motivation spelled a path to failure. But thanks to an innovative program through the University of Nebraska at Omaha, these talented artists are connecting with others in the community and participating in workshops with professional artists. Pakasso Project, a name influenced by the artist Picasso and combined with the South high school mascot Packers, focuses on the academic success and mentorship of its students. The program has helped four students including Rodriquez and Gomez dedicate their talents to a more productive cause and teach them the discipline they need to get better grades. The project is one of five participating high schools launched this past school year by UNO Building Bright Futures, a school engagement and attendance initiative. Other one-on-one feature programs are at Northwest High, Blackburn, Ralston High and New Horizon. One tactic to accomplish this goal is to help the students change their perspective about why they did graffiti. Most students used it as a way to relieve stress and end up hanging with the wrong crowds and possibly getting into trouble because of it, Bishara says. Rodriguez says she used graffiti as a regular means to get away from her life’s problems until she joined the program. She now has a different outlook on her life. Rodriguez is one of the only female artists in the city with a familiar style to her tags. Her pieces characterize her emotions and tie in the social issues she notices going on around her. Her latest technique incorporates newspaper pages and a scrapbook appeal for background, with the acrylic images painted on top. When she started the program, she was failing every class except one and now she is in summer school passing five classes, allowing her to graduate on time. Gomez’s style differs sharply from Rodriguez’s but adds to the dynamic talented group. His approach incorporates sharper edged and animated images. Gomez is developing his own signature style and expanding his talents using different medium such as watercolors and woodcarvings. Gomez failed every class first semester last year and dealt with some drug abuse problems as well, Bishara says. Presently, Gomez remains drug free and sharpening his skills and stylistic approaches. He knows his work has paid off and now Gomez is looking forward to working at the Kent Bellows Studio and Center for Visual Arts this year. Gomez said he believes passion is having the ability to get better at something and not doing it for others. He said a lot of his friends started drawing a few years ago but did not continue on.